Lot:1150 1810 Capped Bust Left Half Eagle. BD-4. Rarity-2. Large Date, Large 5. MS-62 (PCGS). 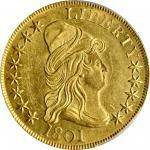 1810 Capped Bust Left Half Eagle. BD-4. Rarity-2. Large Date, Large 5. MS-62 (PCGS).This is a lovely example of the type with razor sharp to full striking detail over virtually all design elements. Satiny mint luster blends with original deep gold patina to provide strong eye appeal. Uncommonly smooth in hand for the assigned grade, and sure to catch the eye of advanced gold type collectors. BD Die State a/a. The Large Date, Large 5 emGuide Book/em variety of the 1810 half eagle corresponds to the BD-4 attribution, making this an easily identifiable variety. It is also the most plentiful of the four known die marriages of the issue and, with more than 500 coins extant in all grades, the 1810 BD-4 is one of the most popular type candidates in the entire Capped Bust Left half eagle series of 1807 to 1812. The example offered here, worthy of the strongest bids, would do nicely in any Mint State set.